Mapping these new connections takes time, so I’ll have more to share over the next few weeks. What I’m going to give you today is a rather short letter covering my overall impressions – my sense of feel of what I took away – and a few of the great lines that really impacted me. This was my 15th Strategic Investment Conference. Each year I walk away wondering how we can make the next one better, and so for we seem to have been able to do that. We set an incredibly high bar this year, according to the feedback we’re getting. In the early years of the conference, I simply tried to get the best speakers I could. My Rolodex was small and my budget was tight. For whatever reason, I have finally developed a large and diverse network of speakers to draw upon. And while there are a few speakers that I just have to invite back every year, I try to create a program that can speak to the economic and geopolitical moment we find ourselves in, every year. As I was creating this conference there were five large questions that I was mulling over. 1. I see nothing on the immediate horizon that suggests a recession in 2018. I know a couple of people who have compiled recession indicators that are generally good for about nine months out, and right now a 2018 recession just doesn’t appear to be in the cards, even though the consensus is that the economy will slow (more on that below). But there is always another recession; and if it’s a recession in the US, that generally means it’s a global recession, and those are always market-moving events – and by market-moving I mean all markets everywhere. The current recovery is getting long in the tooth, but that doesn’t mean it can’t last a lot longer. Australia has gone (I think) 26 years without a recession. So I had some serious macro watchers among our speakers and panelists. 2. I am extremely concerned about the rising debt levels of the developed-world governments and China. Not to mention the swelling debts of individuals and corporations. I don’t see how this piling up of debt ends well – but then I don’t even see how it ends. Japan has monetized an extraordinary amount of its debt, and its currency has gotten stronger. That is not what we learned should happen in Macroeconomics 101. Monetizing the debt has always meant a deep, and often seriously destructive, devaluation of the currency. What has changed? Is it demographics or is it something else? It’s a serious question, and until we have an answer for it we are liable to be stumbling around in the dark, making poor investment decisions. I wanted answers from our speakers. 3. We have to be able to put money to work if we want our portfolios to grow. And even though US stock market valuations are in nosebleed territory, the US market is not the only game in town. Where are people putting money? Where are the great opportunities? So I put some extremely successful investors who are more rifle-shot than macro types on the stage. 4. Longtime readers know that I have a fascination with the future and the direction of technology. I made sure a few of the presentations addressed those areas. 5. Finally, we are seeing a regime change in politics and indeed in the nature of the relationships of people to government. Possibly even more profoundly, it is beginning to look like we are changing the very nature of how we relate to each other as human beings. Compound this with the extraordinarily rapid technological change that is happening everywhere, and it feels as if our cultural foundations are shifting beneath us. I am going to devote at least one letter to a panel that I was able to pull together with Democratic pollster Pat Caddell; Neil Howe, who is the single best expert on generations and especially on Millennials; and Steve Moore, currently at the Heritage Foundation. That panel was convened on Thursday evening, and we were supposed to close at 9 o’clock. As I began to announce that it was time for the last question, the crowd very aggressively let me know that under no circumstances was I allowed to close the panel! At 9:40, when I finally called an end, hardly anybody had left the room, and many of the attendees then rushed the stage to get answers directly from the speakers. We had clearly struck a nerve that was shaking the audience members to their very core. Honestly, you really want to see that video. I can tell you that I’m going to watch it several times. I’m not going to tell you that I liked what I heard or some of the conclusions we came to. Frankly, they worry the hell out of me. But as my dad used to say, you have to play the hand you’re dealt. When will the next recession start? I kept asking the speakers on-stage and off-stage plus a lot of the really smart people in the room that I know are extraordinarily well-versed in economics and economic cycles. I always try to close the conference with a powerhouse panel, and I put the question to them. Their consensus and general consensus of the conference seemed to be 2019 or possibly as late as 2020. We have just stretched the rubber band too tightly, and it’s fraying. Consumer spending, the driver of the economy, is beginning to slow. Consumers have accumulated about as much debt as they can tolerate. Savings are at a ridiculous low. While Friday’s job report got the markets all excited, perhaps the reason that enthusiasm has cooled is folks are realizing that the 50k gain in retail jobs isn’t syncing up with the -4.4% SAAR decline in retail sales over the past three months. Then there is what we are hearing from the horses’ mouth. Walmart (NYSE:WMT) and Target (NYSE:TGT) both issued weak guidance, as did Kroger (NYSE:KR) which also suffered from shrinking margins. A tight and tightening job market is unlikely to help with that. Costco (NASDAQ:COST) missed on EPS, as did Dollar Tree (NASDAQ:DLTR), which also missed on EPS and gave weaker guidance. Big Lots (NYSE:BIG) saw a decline in same store sales. At the other end of the spectrum, the 70k gain in construction is in conflict with rising mortgage rates, traffic and declining pending home sales, while the 31k gain in manufacturing has to face a dollar that is no longer declining, high costs on tariff-related goods, and potentially some sort of trade war. And do you think automobile manufacturers are going to be able to maintain their current high production levels in the face of literally tens of millions of high-quality leased cars coming off their leases in the next few years? Not to mention the hit they’ll take from steel tariffs? I know that many readers support the steel tariffs, but there wasn’t much support in the crowd at the conference, especially from the large contingent of non-US attendees. One of my main concerns – and it’s one that I have expressed in this letter for 16 years – has been a move to protectionism and trade wars. That would be pretty much end economic progress as we know it and usher in a period not unlike the Great Depression. It would not be the end of technological progress, just global economic progress. I’m going to spend a whole chapter in my book talking about how things are so much better than they were 20 years ago or 40 years ago or 60 years ago. The simple fact of the matter is that things are getting better almost every year on a wide variety of fronts, at least from a global perspective. I think people will be surprised at the data on how things are improving in the developed world on the matter of putting carbon into the air. Even China is trying to get into the cleanup act. Which I applaud, because I don’t want to see the air I breathe, and I don’t want anything in my water but scotch. I like to think of myself as a sane environmentalist. But that does not mean things are getting better from individual perspectives in various parts of the country and the world and especially for particular groups within countries. More on that below. Those of us of a certain age have lived through a half-dozen or more recessions. But it helps if you can have a little warning so that you can get ready, not just with your portfolios but with your business. Frankly, recessions can be quite useful for growing your portfolios and businesses if you prepare for them properly. But preparing for a recession that seemingly never materializes is also bad for business and portfolios. Timing is everything. No one actually knows when a recession will start. People have opinions based on past performance and personal experience, and past performance is generally worthless in the world we inhabit today. 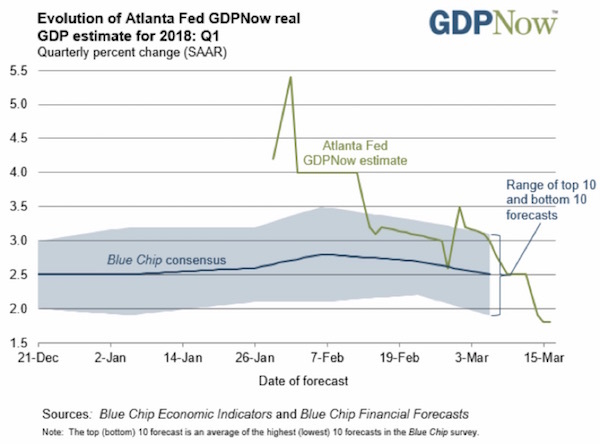 One thing I do know is that the Atlanta Fed’s GDPNow metric, which tries to predict what GDP for the current quarter will turn out to be, has dropped precipitously in the last 45 days. Those of you who are interested in how they actually create their model can click on the link above. Their Q1 GDP estimate has plunged from 5.4% growth to 1.8%. Even my great friend Steve Moore admits that we would have to have multiple years of 3%-plus growth in order to overcome the current deficits that we have racked up by working from a supply-side approach. We haven’t had 3%-plus growth year-over-year since the 90s. Let me be blunt. We needed those corporate tax cuts in order not to make the biggest companies in our country more money but to help our middle-sized companies be more competitive globally. Frankly, I just don’t give a rip about how profitable Apple or Google are or how much tax savings they get. The FANGs just don’t create that many jobs in the grand scheme of things. They represent a lot of jobs to be sure, but they don’t reach deep into Middle America. That’s what small businesses and startups do. But we are not seeing a monster increase in capital spending from these tax cuts, at least so far. Executives seem to be saying that they’re going to increase stock buybacks and dividends. And while I’m all for dividends, those typically don’t create jobs, and jobs are what we need. I come away from this conference with my recession antenna up. Recessions don’t happen overnight. Things start slowing down and then they roll over. Some of the attendees think the next recession will not be all that bad, while others think it will be worse than the Great Recession. I think the outcome depends on the timing of the next recession and the political reaction. More on that later, too. Maybe it’s because of the experience of the last month and because we tend to read the latest trend into our forecast, but there was a consensus at SIC that market volatility is going to resume its normal place in our lives. Five percent drawdowns are actually quite normal in any given year and sometimes occur several times in a year. What is not normal is 15 months of less-than-2% drawdowns, which we just experienced. The volatility of February was not the odd thing; it was the preceding 15 months that was extraordinary. Have we seen a market peak, as my friend Doug Kass thinks? Maybe. I have no idea. That is why I have my personal portfolio and those of the clients who work with me structured to be in diversified trading strategies and not be actually long (or short) everything. And then we rifle-target specific investments that I think have long-term potential or can produce reasonable fixed-income returns. At SIC I did not gain any comfort on the problem of rising global debt. Everybody agrees it’s a problem, but there’s no consensus on what to do about it. A question I posed many times was, where we going to sell $2 trillion worth of US Treasuries in 2018? And it’s not just the on-budget deficit; it’s the off-budget deficit and the money that the Federal Reserve seems to indicate it is going to sell into the market. The world is buying less of our debt now, too. Lacy Hunt says we will have to buy it. I told a joke that I will not repeat here, but the punchline is basically, what do you mean by “we.” And at what price? I get the concept of supply-side economics and tax cuts creating growth that will overcome the deficits. But those tax-cut precedents that are referred to, the ones during the Kennedy and Reagan years, were implemented in completely different economic environments. Number two, we don’t have a Clinton and a Gingrich who can sit across the table from each other and come up with a way to balance the budget. The budget deficit they were trying to balance out was considerably smaller than the one we have today, too. We are one recession away from $30 trillion in total debt, not including state and local debt. Altogether, that’s well over 160% debt-to-GDP. And as we will explore below, it can get worse. They all had places where they felt you could put money to work today. I will point out that David Rosenberg has shifted from a full-throated bull to bearish. He was very pleased that Gluskin Sheff, the large money management firm he works for in Canada, has moved to 25% cash. I came away with the feeling that he would like to see that figure increased. But all of our “bears” had good ideas for putting money to work now. I think my biggest surprise of the conference was that two of the speakers I invited, John Burbank of Passport Capital (who I had been trying to get to come for years) and Mark Yusko of Morgan Creek, both of whom I thought were in my macroeconomics contingent, have completely shifted their business plans in the last few months, moving away from trying to predict macro developments, which they believe are incredibly more difficult to plan for than in the past, to focusing on specific investments, setting up new funds and strategies. Mark Yusko essentially echoed that theme. I was surprised that they are both looking at how to get involved in the cryptocurrency world. We had a panel on cryptocurrencies that I found fascinating (I admit to being somewhat skeptical). I was entranced by the 28-year-old multibillionaire who has become the largest miner of Bitcoin and other cryptocurrencies in the world. George Gilder is a longtime friend. I interviewed him for 30 minutes, and I have never seen him more animated on stage. He had graciously helped me prepare for the interview by giving me the latest version of the manuscript of his new book, called Life after Google, in which, while acknowledging the prowess of Google and Facebook and the other large tech companies, he talks about coming technological changes that will change everything – again. George is not shy about predicting technological change. In 1990 he wrote the following amazingly prescient words. He had no idea I was going to display them on the screen. As I started to read them he stopped me, reminding me that he had given that speech before. He then stood before the audience and quoted those lines, and more, from memory. Remember, that was 1990. We were still using bricks for cell phones, if you could afford them, and they worked only in your neighborhood. So when George makes predictions about a coming regime change in the technological world, perhaps we should pay attention. Because that means there are going to be extraordinarily valuable new enterprises being built –and a number of the people on our stage agreed, naming names and companies. The most important feature of an information economy, in which information is defined as surprise, is the overthrow, not the attainment, of equilibrium. …the great peril of establishment Republicans from the time of both Bushes through the presidential candidacy of John McCain. All cherish the illusion that leading Yale, Harvard, and Princeton economists possess vital wisdom about the economy. They generally don’t. Their preoccupation with static macroeconomic data blinds them to the actual life and dynamics of entrepreneurship. Their preoccupation with liabilities and debt blinds them to the impact of their policies on the value of economic assets. Their GDP model, where everything is measured as a kind of spending – power rather than knowledge – pushes them to manipulative policies and redistribution inimical to business value and growth. Believing that a weaker dollar is just the thing to spur a sluggish economy, by hyping the spending category of “net exports,” they miss the consequent devaluation of all the assets of the country. The final panel, with Pat Caddell, Neil Howe, and Steve Moore, was a revelation. I’m going to do a full letter on some of the conclusions they reached and on the conversations I have been having, based on what I learned from them. Bottom line: If we have a recession between now and 2020, the chances of Trump’s being reelected are not good. Some of you that might consider that to be a good thing. But what is likely to ensue is a left-wing populist government that will enact tax increases. Ironically, since a pre-election recession will increase our deficits even more, you will see the Democrats running on a deficit-reduction platform. Only they will be planning to do it not by cutting spending, except possibly on defense, but by raising taxes. Any tax increases sufficient to cut the deficit will throw the country into back-to-back recessions again, and we could easily be looking at $40 trillion in national debt by the mid to late 2020s. I don’t care how low interest rates are; we can’t pay off that kind of debt. Not in a world where technology is about to eat up 25 million jobs, just in the US alone. Can we monetize that debt? I don’t know. Japan seemingly can. Europe is on its way to doing so. We’re entering a period of volatility and instability unlike anything any of us have experienced, except perhaps for the oldest of us. It will be worse than the 70s. And all of this is going to happen in the midst of massive technological change, with its resultant economic dislocations. Factor that into your business and investment models. As I said, I have a lot to think about. I will be sharing those thoughts with you over the next few weeks. Stay tuned. 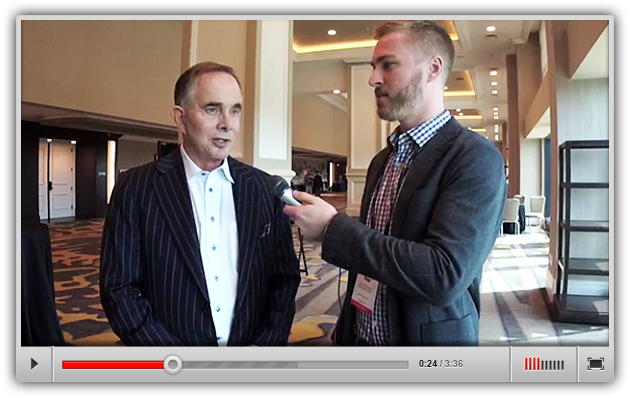 My marketing team has asked me to include a video of Robert Ross interviewing me at the very end of the conference. It’s a very short interview with my first out-of-the-box impressions. 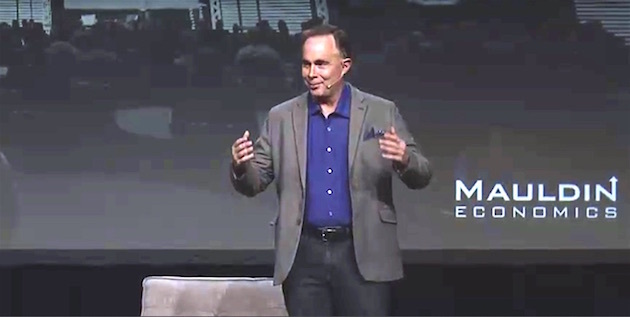 If the information from the conference is of interest to you – and it should be – you can get all the videos, the audio, and the transcripts from our speakers and panelists and access to literally multiple hundreds of slide presentations. Over 1,000 people have attended the conference in virtual format. (If you are a writer of some kind and don’t order the Virtual Pass just to get access to the slide presentations, you are not paying attention. Just one writer to another.) They tell me the Virtual Pass promotion will stop soon and the price will go up, so do it now. We had at least a dozen staff working to put this conference on. I think I got more compliments on how smoothly the conference was going than I ever have. It does take quite a team. I’m extraordinarily proud of how well everything worked, from the registration booth to the backstage coordination. Everything went off like clockwork. And speaking of the stage, I don’t know of an economic or investment conference anywhere that has a stage and the technology behind it that are up to our standards. We’ve had the same team doing our conference for 12 years. If you walk back-stage you’ll find about a dozen people driving the technology from over two dozen laptops and very large TV screens. There was more technology than we used to put a man on the moon. Plus, this year we were live streaming; so, with almost 600 attendees and 700 people watching via the Live Stream, we were reaching more people than we ever have. Here’s a photo from the back of the packed room. I want to thank our speakers. Almost to a man or woman, they cut their speaker fees for me. You don’t even want to know what my speaker budget is, even after they cut me some slack. Nobody pays to get on my stage. Most conferences have two or three headliners, and everybody else is paying. We make far less than most conferences because we don’t cut corners and we don’t sell speaker slots. But that is why SIC has nothing but A-list speakers. Next year we will be back in Dallas, May 13-16. Book it in your calendar right now. I am committed to making it our best conference ever – even if I don’t quite know how I will do that. But you won’t want to miss it. And finally, I want to think the attendees. Well over half have been to multiple conferences and many have come back for five years or more. That is the highest compliment I can imagine. Thirty percent came from outside the country, with over 30 countries represented. Some of the Aussies have been coming for five years running – there were 33 of them this year. And with that I will hit the send button. Have a great week. After I take a few days off, I am going to dive back into work and writing that book, which is the 1,200-pound gorilla on my back. March 24, 2018, 3:27 p.m.
March 18, 2018, 8:02 p.m.
Why would you want to dilute good scotch; even with water? It’s meant to be sipped straight up. Look for anti-trust action against Goggle and Facebook based on their high percentage control of their markets. Amazon could come after them.